When you make felt for the first time, it seems like some sort of magic. When you make felt for the fiftieth time, it still feels like magic. And when you make felt for the five-hundredth time, its magic seems even more powerful because you know that this is no fluke, that you are involved in a dialogue.Unlike Scandinavian countries and Asian continent, the United States has no traditions of feltmaking. Well, feltmaking began in the United States in the 1970s at a time when soft sculpture and macrame were popular. Early fiber artists and craftspeople often made soft, textural felt that was incorporated into mixed-media artwork. 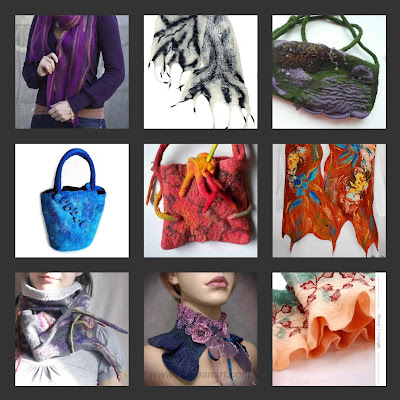 For years, feltmaking was mostly something people briefly explored, much like tie-dye. As feltmakers began to work in greater numbers, they eventually helped to define felt as a separate medium unto itself. In the past 10 to 15 years, the medium has explded in popularity as American felters catch on to this fabulous goldmine of creative opportunity. What could be better then a material that not only lends itself to a quick afternoon of play, but can also offer a lifetime of professional study? 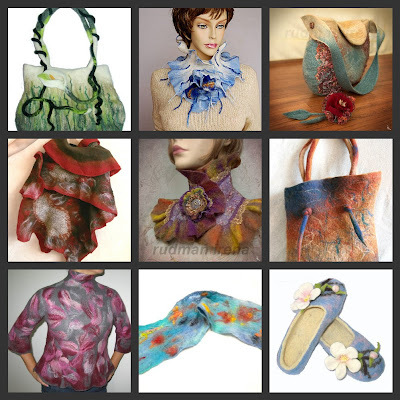 Most people are truly shocked when they realize how sheer and light and drapable felted clothing can be or how texturally interesting, artful, and colorful felt is. We've simply had no precedent for anything like it. When this delightful surprise is coupled with tha fact that felt is made from a natural, sustainable material that is both gentle on the earth and of a familiar softness and feel from our childhood, it is very easy to understand the immediate appeal. I love felted wool! and I love make felting it's meditation!